In 2011 Paul McCartney is still leading the way. July saw Paul voted the ‘Best Live Act’ of the last year at the prestigious UK Nordoff Robbins Silver Clef Awards. It was a public vote and Paul beat acts from a shortlist of 30 including Muse, Green Day, Jay Z, Pink and Black Eyed Peas. In the same month, Paul and his band of nearly ten years (Paul ‘Wix’ Wickens, Brian Ray, Rusty Anderson and Abe Laboriel Jr.) embarked on their all new ‘On The Run’ tour. The tour kicked off with a two-night run at New York’s iconic Yankee Stadium and then took in six massive shows in North America and Canada. The unrivalled feedback and reviews backed up the ‘Best Live Act’ Award as well as cementing Paul’s reputation as one of the world’s greatest performers ever. 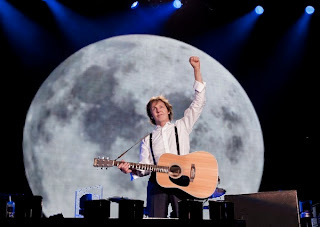 Today, Paul announces his new ‘On The Run’ tour is coming home and he will bring 2011 to a close with 11 special shows. Starting out with his first ever show in U.A.E at the Abu Dhabi Grand Prix, the tour will then rock n’ roll into Europe and Russia. It concludes with a concert in Paul’s hometown of Liverpool exactly a year to the day since he played a tiny intimate show at Liverpool’s O2 Academy late last year, which ended with Paul handing out hot drinks to fans waiting outside the venue in freezing weather conditions. Paul is already earning something of a reputation for his extraordinary Christmas homecoming shows after a series of special UK shows last December as well as his first ever, much talked about show at London’s O2 Arena in December 2009. These new dates will also take in the O2 Arena once more, Paul’s first visit back to the venue since using it to rehearse for his massive 2010/2011 ‘Up and Coming’ tour. As well as his first visit to Abu Dhabi, the ‘On The Run’ tour will see Paul’s first ever live show in Bologna, Italy as well as his first shows in Sweden and Finland in seven years. He also returns to France, Germany and England and will make his third ever appearance in Russia; his first of which was immortalised in the historic 2003 DVD ‘Paul McCartney Live in Red Square’ and his last being in 2004 in St Petersburg. As anyone who has seen it will confirm, the Paul McCartney live experience goes so much further than simply a normal concert. Throughout, Paul takes his audience on an emotional journey that touches everyone in a different way. Whether performing to just 200 or 500,000 people, Paul has the ability to connect with everyone in the audience. When this is coupled with the most envied and respected back catalogue in music, you have the ingredients for a once in a lifetime experience. On stage, Paul barely has time to catch his breath as he jumps from instrument to instrument, bounds tirelessly around the stage and sings nearly 40 songs - the ultimate value for money show. In a lifetime of performing, Paul has played a truly staggering range of venues and locations. From pub gigs to huge outdoor parks and stadiums; unannounced stripped-back university shows with Wings to performing at Buckingham Palace, Paul has even played into Space, in Moscow’s Red Square and at the White House to name just a few. In recent years, Paul’s live shows have even acquired a new legendary status, garnering unprecedented reviews from fans and critics alike wherever he goes. In 2010 Paul performed over 30 ‘Up and Coming’ tour dates across North America, South America and the UK. Last year saw many career firsts wherever the band played. These included rocking The White House in front of President Barack Obama and his family in June when Paul was made the first ever British recipient of the prestigious Gershwin Prize For Popular Song. Paul returned to the White House again in December (where even the President joked about Paul becoming a regular there!) to be awarded with a Kennedy Center Honor. Paul ended 2010 with a visit to Saturday Night Live in New York City followed by a career landmark first ever performance at Harlem's famed Apollo Theater on December 13 and three intimate homecoming shows in the UK. He played the smallest club show of his career at London’s legendary 100 Club to just 300 people, which made headlines as far as China. The final two shows were at the Hammersmith Apollo and at Liverpool’s O2 Academy, both of which broke venue box office records. McCartney kicked off his 2011 live agenda with his first ever show in Peru, his first Chilean gig since 1993, and two blockbuster shows at Rio de Janeiro's Estadio Olimpico Joao Havelange, which also resulted in the first ever concert to be broadcast live on the internet throughout Latin America - allowing over 1.5 million fans who were unable to snap up one of the 100,000 tickets to share in the magic. Like his visits to South America in 2010, these trips resulted in total and utter Macca-mania wherever he went. Fans built makeshift ‘McCartney villages’ as they camped outside the stadiums, waiting for days for the doors to open, in order to get the best possible positions at the front of the crowd. Over fifty years into his career, he continues to push boundaries, perform to millions and make global news with countless monumental shows. Tickets go on sale this Thursday (13 October) at 9am.